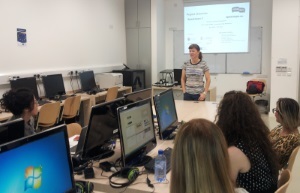 As part of the dissemination programme of the SpeakApps project, Jackie Robbins visited the University of Cyprus Language Centre this week to give two workshops to the enthusiastic foreign language teaching team there. In addition to teachers of English, teachers of Greek, Turkish, French, Italian, Spanish and Russian also attended. The participants took part in activities using the SpeakApps tools Langblog and Tandem, spent time considering task design for oral production and oral interaction tasks in these tools and how to incorporate them into their own teaching context. They also created tasks of their own in the SpeakApps OER for use with their own students in the future. Thank you to the local organisers of this event for such a warm welcome and to the teachers for their active participation in the workshops! ◄ SpeakApps è arrivato in Italia!